This must be the best, and craziest, crazy quilt I've ever seen. In 1882, one Mrs. David McWilliams said to herself: "You know, some chipmunks would go so nicely right there" and saw fit to incorporate two 'taxidermically stuffed chipmunks' on her cray-zay, crazy quilt. No one does inadvertently creepy like those Victorians. Crazy quilts are my favorite inspiration for embroidery, but they really aren't quilts at all since no actual quilting is used. It's all about the insanely detailed, repetitive, decorative embroidery. It seems like embroidery's last true craze as a fad was around the time of the crazy quilt, when women were manically stitching any shred of shiny fabric they could get their hands on, mammals included. You can click the picture for a closer view of the chipmunk detail. The quilt is in the collection of the Missouri Historical Society. 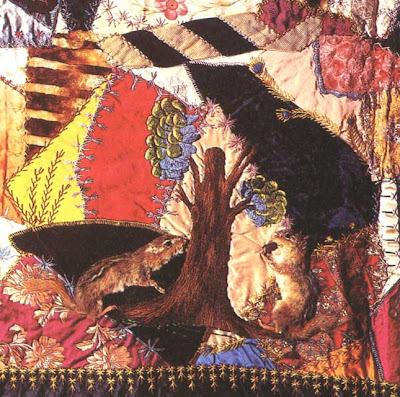 Image from Crazy Quilts by Penny McMorris (1984, E.P. Dutton - OOP).